With a stay at Cape Sunset Villas - Guest House in Cape Town, you'll be a 1-minute drive from Sunset Beach and 6 minutes from Bloubergstrand Beach. This beach guesthouse is 9.1 mi (14.7 km) from Victoria and Alfred Waterfront and 12 mi (19.2 km) from Table Mountain. Make yourself at home in one of the 6 guestrooms, featuring kitchens. Rooms have private balconies or patios. Complimentary wireless Internet access keeps you connected, and satellite programming is available for your entertainment. Conveniences include safes and coffee/tea makers. Head down to the water and enjoy a day at the private beach, or take advantage of other recreational amenities, which include a seasonal outdoor pool. Wrap up your day with a drink at the bar/lounge. A complimentary continental breakfast is served on weekdays from 8:00 AM to 10:30 AM. 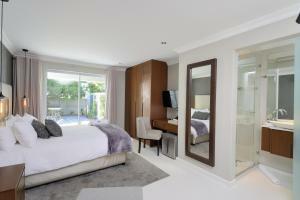 When would you like to stay at Cape Sunset Villas - Guest House ? Due to drought conditions, water restrictions apply at this property until further notice. Guests can expect periodic water supply outages or reduced water pressure during their stay. For more details, please contact the property using the number provided on the booking confirmation email. Due to drought conditions, water restrictions may apply at this property until further notice. For more details, please contact the property using the number provided on the booking confirmation email. Each day we'll check prices and send you an email for your selected dates at Cape Sunset Villas - Guest House. If you don't have specific dates but would like to check prices for say next weekend or say next month we can check the price too. Click to write a review and share your experience of Cape Sunset Villas - Guest House with other travellers.